My husband actually first made these Roasted Fingerling Potatoes last week and I couldn’t stop gushing about them. Crispy around the edges, soft in the center and tossed in herbs and seasonings for flavor – what’s not to love? 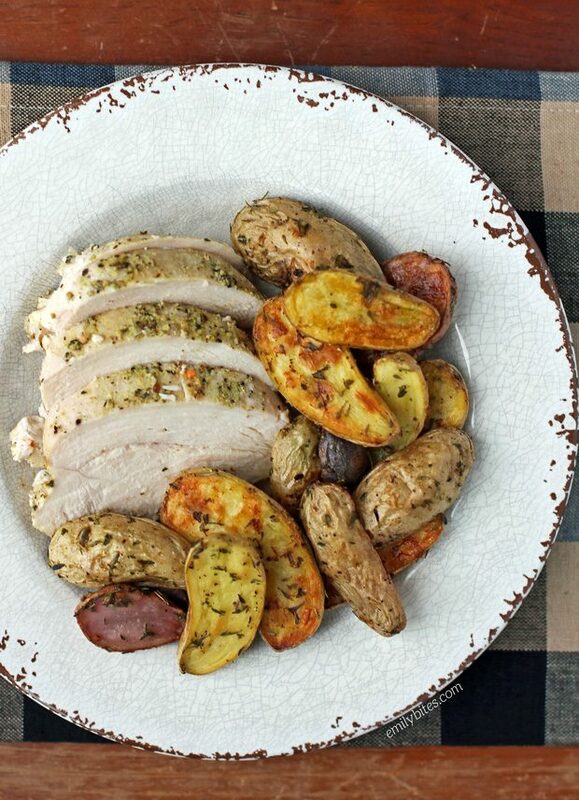 Roasted potatoes are like French fries’ healthier cousin. I realized when I started putting together my 2016 Reader’s Choice Awards that I didn’t make a ton of side dishes last year, so this year I promise to bring you more, starting with these! Not only are these Roasted Fingerling Potatoes delicious, but they also come together really quickly with minimal prep time (just slice, toss and bake). Perfect for any night of the week! Want to make two side dishes at once with almost no extra work? You could also easily roast veggies in the oven at the same time and temperature (even on the same baking sheet if you have room). I like to do broccoli and carrots, but do whatever you like! As a side note, in case you noticed my potatoes were tri-colored, Wegmans sells a fingerling potato medley and I always get that kind because my husband loves purple potatoes. Normal fingerling potatoes will work just as well! Looking for more tasty lightened up side dishes? Try my Garlic Roasted Green Beans with Almonds, Loaded Cauliflower Bake, Parmesan Roasted Sweet Potatoes, Spinach and Parmesan Orzo, Cheesy Broccoli Bake, Garlic Thyme Roasted Carrots, Easy Garlic Knots, Butternut Squash Quinoa Salad, Roasted Smashed Garlic Potatoes, Sweet Potato Casserole Stacks, Cheddar Bay Pull Apart Muffins, Cheddar Broccoli Orzo, Broccoli Salad, Tomato Cobbler and many more in the Side Dishes category of my recipe index! Pre-heat the oven to 425. Line a baking sheet with aluminum foil and spray the aluminum foil with cooking spray. Set aside. Place the halved potatoes into a mixing bowl and drizzle with the oil. Stir to coat. Sprinkle with the thyme, parsley, salt, pepper and garlic and stir until well combined. 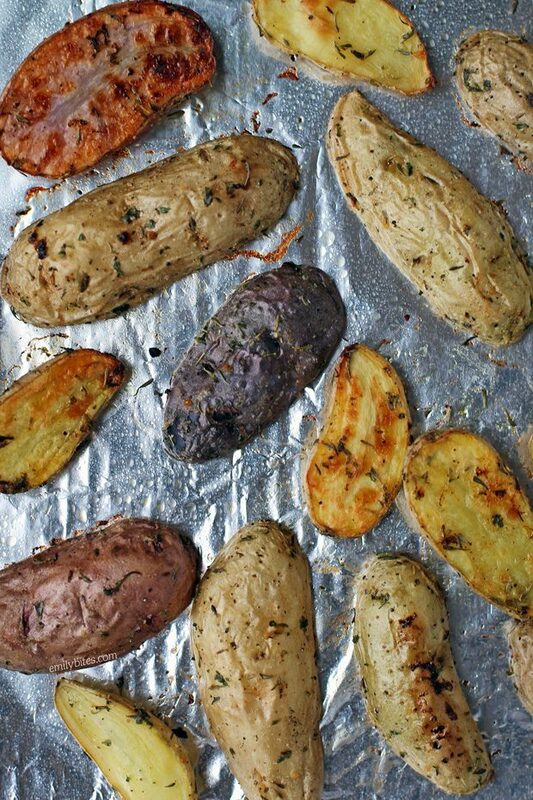 Transfer the coated potatoes to the prepared baking sheet and spread in a single layer. Place the sheet in the oven on the center rack and bake for 30-35 minutes until the edges are crisp and the centers are cooked through. The bottoms of the potatoes (facing down on the cookie sheet) should be golden. Serve warm. Hi Emily! What are fingerling potatoes? These look like regular white potatoes to me. You say the bottoms (facing down on the cookie sheet) should be golden. In your picture, though, some are up and some are down. Should the bottoms be down when they go in to roast, or does it matter? Did you put the same seasoning on the chicken? It looks delicious in the photos. Thank you! The chicken has a citrus pepper seasoning mix that comes in a shaker from our local grocery store. 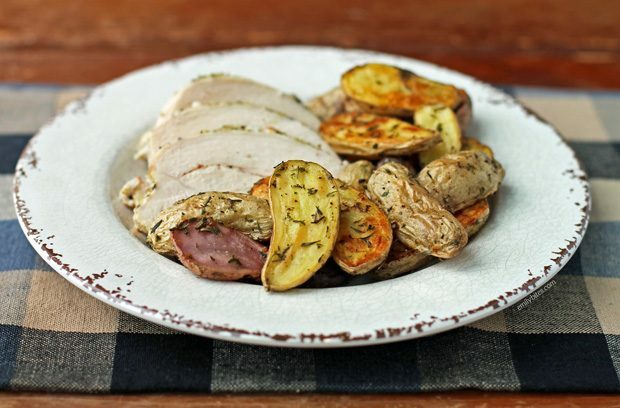 You could definitely use the potato seasonings on chicken too though :). In the directions you don’t refer to the 1 T oil that is in the ingredient list. Please advise what to do with this and at what stage of the recipe. Oops! I don’t know how I did that. Thanks for pointing it out. It’s fixed! Is that 5 halves of a potato or 5 whole little potatoes for the points? ?